In September of 2014 The Anderson Collection at Stanford University opened in a 30,000-square-foot-building designed by Ennead Architects, showcasing 121 works from 86 artists (among them, Willem de Kooning, Jackson Pollock, and Wayne Thiebaud). The museum came to life thanks to a combination of two elements: the exceptional gift from Harry W. and Mary Margaret Anderson, Silicon Valley collectors, and their daughter Mary Patricia Anderson Pence; and the legendary Stanford President (from 2000 to 2016) John Hennessy’s strategy of creative confidence for his students. Since its opening, nearly 250,000 people have visited the collection, which includes examples of Abstract Expressionism, Color Field Painting, Post-Minimalism, California Funk Art, Bay Area Figurative Art, and California Light and Space. The Anderson Collection is the result of an American success story. In 1948, while a student at Hobart College, Anderson, in association with two friends, founded a food service company. After only four years, the Saga Food enterprise had expanded to more than 400 colleges and universities across the country. Three national restaurant chains were later added. In 1964, a brief trip to Paris and a few hours spent in the Louvre would profoundly mark the Anderson couple. Upon their return home, they decided to start a collection of Impressionist and Post-Impressionist work from 1875 to World War II. However, they quickly realized that Renoir and Monet had already attained market values that greatly exceeded their budget. So they instead turned their attention to contemporary American art and started with Abstract Expressionism. Within a few years, the Andersons had acquired a great number of works by Jackson Pollock, Robert Rauschenberg, Jasper Johns, Richard Diebenkorn, Andy Warhol, and others. The collection eventually became one of the most prominent on the West Coast. 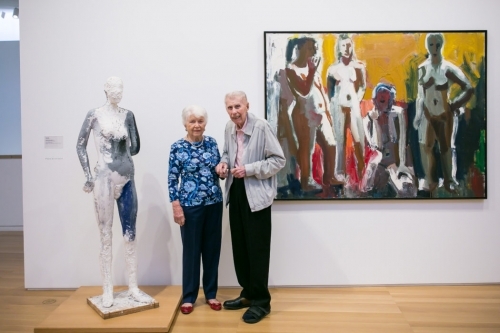 David Ross, former SFMOMA director said, “Their love for art is the only immodest thing about them, it’s been their passion for 40 years—big A for art, little a for Anderson.” In 1992, they even donated some important Pop Art pieces from their collection to SFMOMA. The collectors initially set three questions for their collection strategy. First, is a work was truly original? Second, could they possibly have imagined such a work and do it themselves? And third, is it the best? Daughter Anderson Pence has devoted enormous energy over the years, in visits to galleries, fairs, and studios. She has submitted weekly reports to her parents on what was happening in the art world. Acting as a sort of advance scout, she alerted them to the emergence of new talents, such as Tauba Auerbach, Nick Cave, Liam Everett, Emil Lukas, Julie Mehretu, and David Allan Peters. Harry, who sadly passed away earlier this year, was constantly curious, often going so far as to make special or unexpected requests of artists. Once, having acquired a piece by the West Hollywood-based artist David Allan Peters, he asked him if he could have, in addition to the canvas, the tool he used to make his psychedelic paintings, because he was so fascinated by Peters’ technique. 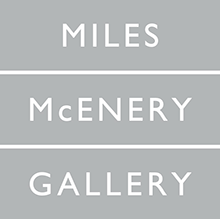 In addition to showcasing core pieces from the Anderson collection, the museum is entitled to receive gifts of art to enrich its permanent collection. Black Painting(2017) by Mary Weatherford, a gift of Debra and Steven Wisch to the museum, is currently displayed and suits perfectly in the Abstract Expressionist space alongside Helen Frankenthaler and Kenneth Noland. In September 2016, the museum hosted a brilliant Nick Cave exhibition at the intersection of visual art and performance. Indeed, museum visitors had the opportunity to experience Cave’s “Soundsuits,” as well as videos and a documentary film. Currently on view is a spotlight on Elizabeth Murray (up through March 2019). Since its beginning in 1964, the Anderson Collection has continued to evolve, and so it will this November when Christie’s will present approximately 200 works from the collection as a highlight of its 20th Century Week sales in New York.